It was a beautiful overcast morning at Skiles Test for the 28 individuals and groups who took on this always changing property. The mosquitoes provided ample motivation to keep up the pace on three challenging courses. It was good to see a few enthusiastic new faces turn out to experience the sport for the first time. Thanks to Frank Baukert for putting on a beginner class and the Dial group for making sure some of the rookies enjoyed their first time out. The fast crowd came in exhausted and sweaty but still smiling after a blind start on the Advanced course. 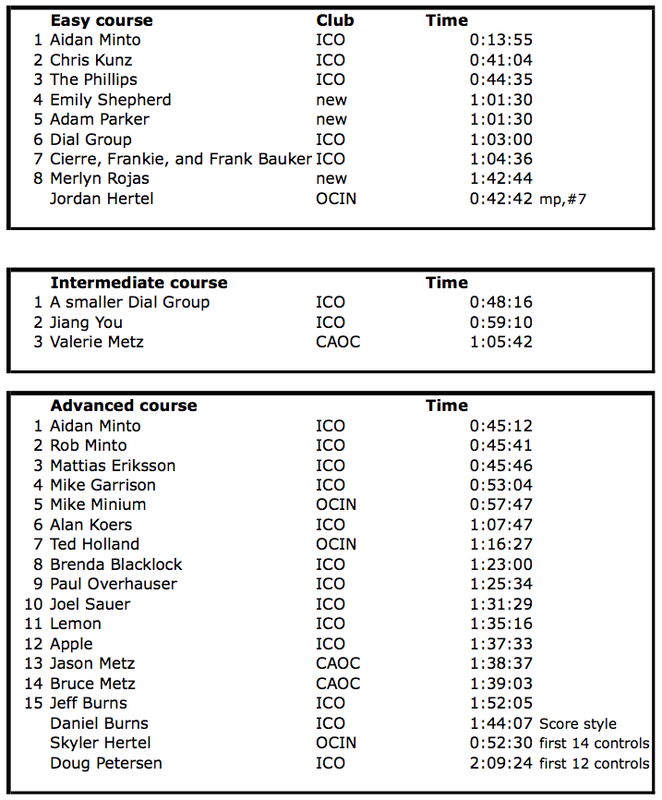 The Beginner and Intermediate courses challenged a variety of runners. Some pushed the pace, others enjoyed a pleasant hike, but all remarked how good it was to be out enjoying the gorgeous morning. Many thanks are due to those who helped: Rob and Aidan Minto for course consultation and field work, Robert Pumphrey, Mike Garrison, Brenda Blacklock, Aidan and Rob Minto for course clean up. Brenda, Rob, and Robert handled sign up and Robert designed the course.